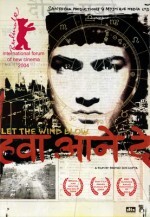 Let the Wind Blow is a bleak portrait of a Mumbai college student on the cusp of several life transitions, as rumors of nuclear annihilation swirl like hot dust in the streets. Aniket Vishwasrao portrays Arjun with a fine insight into his blend of awkward charisma, embryonic sensitivity, and reflexive tendency to sabotage the few positive things in his life. Tempted by dreams of a fast buck in Dubai, enchanted by a high-caste drama club beauty, and anxious at the shady schemes of his friend Chabia, Arjun despairs of finding contentment. Political quarrels and demonstrations fill the streets, and the television pumps warnings of atomic fire. Director Partho Sengupta unfortunately gets lost in his narrative far too often, permitting vaguely sketched conflicts and portentous monologues to overwhelm the film's appealing sense of youthful immediacy. Let the Wind Blow's arty visual indulgences and minimalist soundtrack impress much less than Sengupta's skill for discovering small, intoxicating details, such as an urchin hawking business self-help books or a Hindu deity who approaches Arjun for a cigarette. Lamentably, the film's thoroughly black conclusion, plainly born of moralizing intentions, feels a little like an escape hatch.